The head of Sales Development for a $50M SaaS company recently shared some interesting team data with me. Excluding recent hires and the team currently in place, the group had 55 terminations, promotions, transfers, and quits over the last three years. A little high, but not too far above the median. Roughly 60% of his SDRs were promoted or internally transferred. That’s great stuff! But on the flip side, and a concerning note, nearly 40% of the SDRs promoted to an AE role had been terminated. That surprised me. I wondered if these results were above average, below average, or to be expected. I couldn’t find any public data on the post-promotion failure rate for SDR-to-AE transitions, so I turned to LinkedIn to do my own research. SDRs and AEs go by a variety of names. I stuck with “Sales Development Representative” and “Account Executive” exclusively. There’s a lot of selective truth on LinkedIn. A lot. When I ran a separate search for reps I knew had been terminated, at least a quarter of them spackled over that fact on their profiles. I excluded reps who had made the jump within the last 12 months. A recent promotion doesn’t tell us anything useful about their future success or failure. I counted it as a “promotion success” if the rep stayed 7+ months in the AE role. I counted it as a “promotion failure” if the rep stayed 6 or fewer months. I’m not sure what the right length of tenure is, but I needed a binary and this is where I landed. I built out a data set of ~205 reps – all 3rd degree connections. Again, only former SDRs who made the move to an AE role at least a year ago were included. Of these 205 reps, 26% failed as AEs. That really shocked me. I expected the failure rate to be higher than an experienced external hire. But not that high. 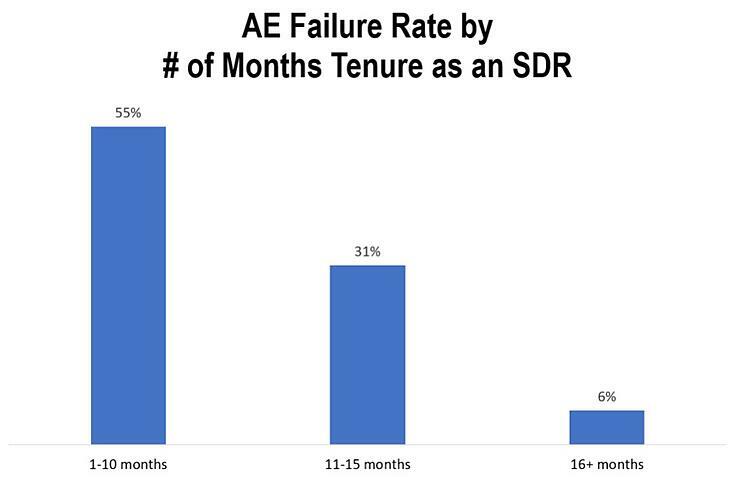 When I looked at SDRs who left their companies to take an AE role somewhere else, the failure rate climbed to 41%. Wow. Along with success and failure, I captured months of tenure as an SDR prior to promotion. To say the impact is huge would be a huge understatement. The post-promotion failure rate for SDRs with 11 or fewer months experience was 55%. The failure rate for SDRs with 16+ months experience was just 6%. None of this is to say you shouldn’t promote your SDRs to AEs. For many SDRs, that’s the goal and more power to them! But it takes time to learn how “businesses” operate, evaluate, and buy. What does a buying process really mean? What’s the difference between signing on the dotted line authority and the ability to scuttle a deal? How do you arm an internal champion? How do you disarm an internal foe? What’s a financial win for the organization? A career/political win for a person? How do they differ? How do you teach, tailor, and take control? These skills are hugely important for success as an Account Executive. I’m not convinced that 10, 12, or even 20 months as an SDR does much to develop them. You might disagree, but the one thing I hope you’ll take away from this is the significant impact of SDR tenure on future success as an AE. I understand the desire to advance (and earn the real money) on the part of SDRs. I also understand the need to fill open headcount and the challenges of this tight labor market on the part of AE managers. But what I’m hoping to point out is that the two tendencies, if left unchecked, set no one up for success. Not reps. Not hiring managers. And not companies.